Add the bell peppers and onion to the food processor and pulse until finely chopped. Transfer the pepper mixture to a fine-mesh sieve and press to extract as much liquid as possible. Add the mixture to the chopped nuts. 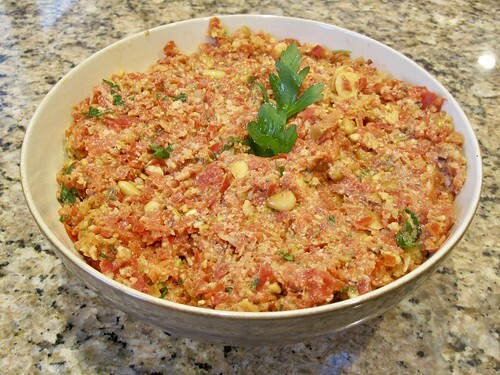 Stir in the pine nuts, almonds, bread crumbs parsley and olive oil. Season with salt and cayenne and serve.